HISTORY HERE is a location-based app that combines GPS with historical content to a “mobile guidebook”. 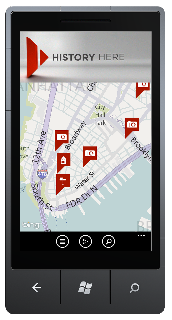 If are proud owner of a Windows Phone 7 phone, the app costs $2.99 and currently has information on more than 7,000 locations nationwide and thousands more historical points of interest will be added in the coming months. 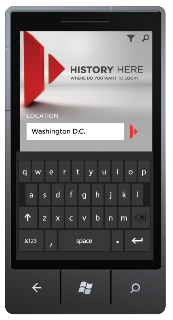 With the HISTORY HERE app for Windows Phone 7 you can search for locations within a 100-mile radius, filter your search on specific types of points of interest and display your search results in map view or list view. 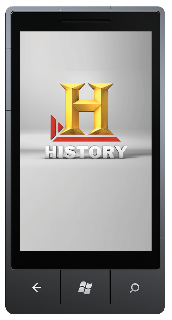 HISTORY™ today announced the availability of HISTORY HERE™, a location-based mobile application for Windows® Phone 7, that brings history to life in thousands of locations across the United States. 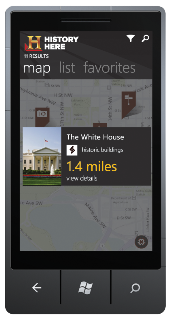 Available to Windows Phone 7 customers in conjunction with the phone’s US launch on November 8, HISTORY HERE™ is the first mobile app to combine GPS with HISTORY’s award-winning content and resources to create a mobile guide that lets users experience the historical context of their surroundings, no matter where they are. 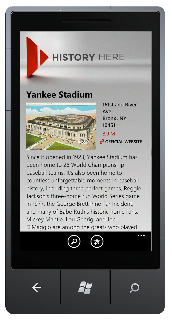 HISTORY HERE™, a featured application in the Windows Phone Marketplace, is available for purchase, beginning today, for $2.99. HISTORY HERE™ currently has information on more than 7,000 locations nationwide and will add thousands more historical points of interest in the coming months. Each location is supplemented with exclusive video, audio of famous speeches, narratives from key moments in history, written content, pictures and maps to create a dynamic visitor’s guide to each location. “Windows Phone 7 is backed by a rich developer ecosystem that is creating a variety of quality apps and games that take advantage of the phone’s unique features and design,” said Todd Brix, senior director, Windows Phone Marketplace, Microsoft Corp. “HISTORY HERE™ is a great example of the kind of rich applications that people will find on Windows Phone Marketplace to get the most out of their phone,” he continued. Distance: HISTORY HERE lets users customize their search to return historic locations ranging from zero to 100 miles away from the searched location. Points of Interest: Just want to see battlefields? Monuments? HISTORY HERE allows you to choose as few or as many categories of historic locations as you’d like to see. Select from “notable location,” “park,” “museum,” “monument,” “battlefield,” “historic building” or “roadside attraction” to customize the experience according to your interests. Map view vs. list view: To optimize the experience for mobile, HISTORY HERE™ lets you see the results of your search in a map view, which gives an at-a-glance view of icons representing search results and their location on a map. Or, for easier scanning, choose list view for a thumbnail view of each location, a one-sentence description and its proximity to the search location.